A non-stick tart pan like this one, is exactly right for easy recipes like flans, tarts and quiches where you don't need to display the dish as well. 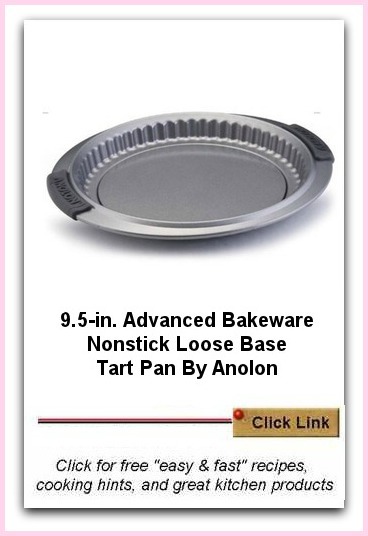 I like this one by Anolon as not only is it a quality product but it has a good weight - not too flimsy and being non stick, it's easy to remove from the pan. For an elegant and sophisticated twist on an all-American Pie, make the pie in a 9.5 inch Tart or Flan Pan. Adjust the ingredients if using a single sheet pastry base. Lay a couple of sheets of short crust pastry on this loose base pan and together with an egg based filling with bacon and cheese, you'll have a quiche! For a vegetarian quiche, add spinach and feta cheese to the egg mixture and pour into the pastry lined pan. 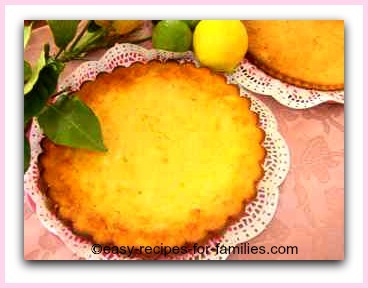 ...and how about the incredibly easy and so delicious lemon tart. All you do is pour the mixture into this loose base pan and bake for 45 minutes! Just watch the top edges of metal baking pans. Many finer gauge metal pans will cut you when handling or in the washing up. The fluted edges especially, will need a little care when cleaning and that's when there's a greater likelihood of being cut. That's why I like this one from Anolon as the edge is molded into a wide lip and it's much safer to handle. Select one with a good weight - it makes handling much easier than one that's flimsy and fragile and you needn't worry about warping. Baking pans for tarts are best if the base is removable. To serve, just lift the base off the sides and slide the tart off, onto a lovely serving platter. I just love that it releases pastry with such ease. I only ever use bakeware that's nonstick. You save so much time when you don't need to cut parchment or baking paper to line the pan. Then there's the step of greasing which is avoided using a nonstick pan. Every little bit of fat we don't consume is all the healthier for us and our families. It also makes washing up so much faster. This Anolon silicone pan is dishwasher safe, slip free and oven safe to 500F/260C.